Avoid Bringing Pests into the Home & Garden - Homestead Gardens, Inc. | Homestead Gardens, Inc. The summer is nearing its end and the garden is looking at its very best. But as we get closer to the leaves changing colors, you may be thinking about how to bring your garden plants indoors without bringing a whole load of insects, fungi, and plant diseases with them. Before reaching for the pesticides, take a try at providing increased opportunities for beneficial organisms to counteract the problems of those garden pests and diseases. You can encourage beneficial insects such as predatory beetles, lacewings, wasps, predatory mites and predatory nematodes by growing certain plants in your garden. Aromatic flowering plants especially those with flat leaves such as calendula, cilantro, fennel, and marigold can help attract beneficial insects to the garden. Beneficial pests such as ladybugs, lacewings and assorted wasps can be bought and released to target specific pests. 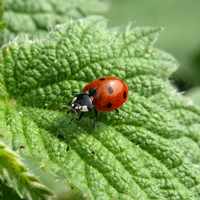 Ladybeetles, or ladybugs, released from May through September on aphid infested plants can assist in making plants aphid-free for overwintering indoors. Ladybugs are attracted to gardens with pollen producing plants that have flat leaves and large amounts of prey insects such as aphids and whiteflies. Beneficial insects are available for purchase at Homestead Gardens from April through July. To develop a plan for your garden with a specialist, feel free to contact Homestead Gardens’ Indoor Gardening Specialist, Kyle Marsh at the Davidsonville, MD store. If you’ve missed the window of opportunity for introducing beneficial insects into your garden prior to bringing plants indoors, we recommend Earth-tone Insecticidal Soap by Espoma Organic applied to plants a few days before bringing them indoors. It can be found in Homestead Gardens’ Lawn & Garden department.